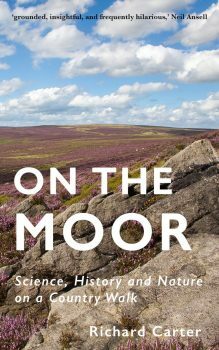 Charles Darwin had his Sandwalk; I have my Moor Walk: a 3.4-mile circular walk from my house, up the hill, across the golf course, on to the moor, up to Trig Point S4643, through the heather, back down off the moor, down the farm tracks, past (!) the local pub, along the lane, down the bridleway, and back to my house. I've lost track of how many times I've been on my walk since August 2001 when we moved into what will almost certainly be, as Down House was for Charles and Emma Darwin, our permanent place of residence for the rest of our lives. The Moor Walk is my thinking walk, which takes up a couple of my hours most Saturdays. The thing I like most about the Moor Walk is that it is the same walk. Apart from the occasional diversion, I walk almost exactly the same route every time, always in the same anti-clockwise direction, always pausing at exactly the same spots. I even have nicknames for some of the stopping places en route: the Pond Skater Puddle, the Rabbit Shed (deep in the heart of Rabbit Country), the Lucky Field (where I nearly always spot something interesting). Familiarity doesn't breed contempt; it makes the Moor Walk very personal, and very special. The Moor Walk is my walk. The South Pennine moorlands aren't exactly rich in wildlife: the acid soil and the blanket cover of bog grass and heather see to that. But the wonderful thing about going on the same walk over and over again is that you always appreciate when you see something new, and you know what to expect to see at certain times of the year. Yesterday on my walk, for example, in addition to the usual red grouse, meadow pipits, lapwings, curlews, rabbits and pheasants, I saw my first wheatears and ladybird of the summer, and heard my first skylark. The swallows are late this year: I have seen them in the lowlands, but not above the moors. Not yet. Nature dead in tooth and paw yesterday. Wheatears, one of my favourite birds, are, like stonechats, only an occasional treat on the Moor Walk, which makes seeing them particularly special. But the most unusual thing I saw on my walk yesterday was on the muddy bridleway less than 100 yards from my house: a dead mole. Doubtless, had Darwin chanced upon a dead mole during his Sandwalk perambulations, he would have popped its corpse into his pocket, taken it back to his study, boiled it, stripped away the meat and flesh, and closely examined its skeleton with the aim of writing a short paper on how Talpa europaea is wonderfully adapted for an underground life eating his beloved earthworms. I, on the other hand, left the mole for the crows. There is a limit to how far one should attempt to emulate one's heroes. Great post, Richard. Doing the same walk (or ride) regularly imparts a real feeling for seasonality and other changes that you just don't appreciate otherwise. p.s. I nominated this post for Open Laboratory 2009.